Colorado Duck Hunting at its Finest!! I remember reading an article that said you’ll need 300 decoys and 6 spinners on a river to be competitive. While I have no doubt that using that many decoys will work, why would you go through that much pain and suffering if you can do just as good with a couple dozen duck decoys? “What kind of decoys should I use?” For early season, a good combination of species always seems to be best. Mallards, gadwall, widgeon, and teal are the most abundant in Colorado and be sure to add some motion into your spread (we’ll touch on that later). 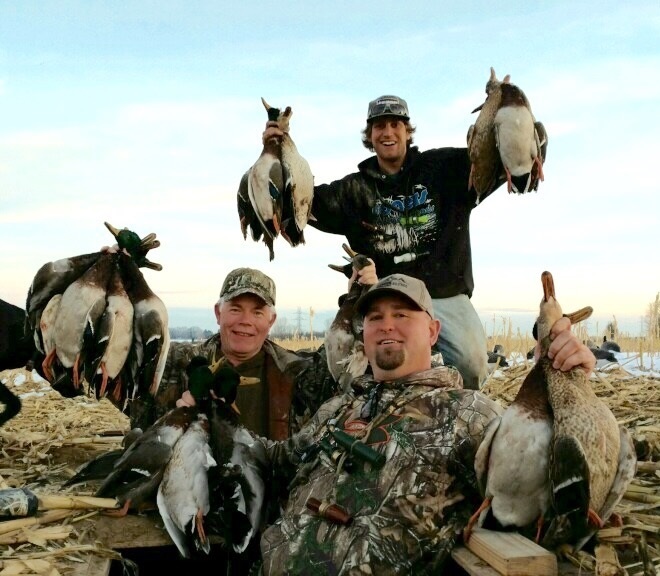 Late season Colorado duck hunting can be done in the field or on a river or slough. For field hunting, spinners are a must. If you’re on a river or slough, gauge how many decoys by the water you’re hunting and remember a spinner or two (once again, more about that later). For early season motion, there’s nothing better than a “Rig’Em Right” jerk cord. These cords have a fancy grip weight on the end that grabs onto the bottom with a bungee cord attached. On top of the bungee are 4 swivels to connect your decoys. Yanking on that cord will put tons of motion in your spread and make everything look alive.